Announcement Outstanding Divination cards crafted with love, light and magic by Intuitive, Teacher, Artist Alexandre Musruck with a successful two decades of private practice with clients around the world. Author of 2 books on Lenormand and the first english book on Kipper card reading. Outstanding Divination cards crafted with love, light and magic by Intuitive, Teacher, Artist Alexandre Musruck with a successful two decades of private practice with clients around the world. Author of 2 books on Lenormand and the first english book on Kipper card reading. 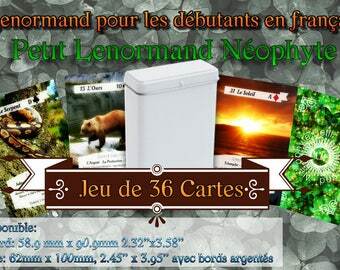 This is great for anyone learning Lenormand...having keywords on the cards without being distracting from the image. I love the bright colors of the cards, imagery used, and helpful guide/resources. Thank you! This deck is just glorious. The holographic effect makes the cards luminous, as if glowing from within. Which, in fact, they are. 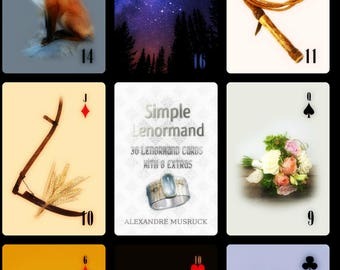 Standard or deluxe version, the Magistral Lenormand will seduce you. I have a passion for divination and I want to share it with you. 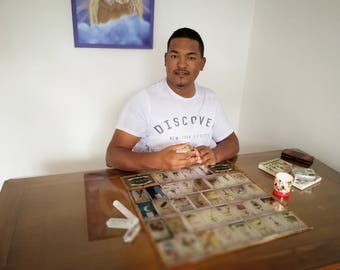 I have a passionate for Oracle cards and I have created numerous decks from Tarot to Angel oracle cards, and of course my many attractive and popular Lenormand decks. I love teaching people how to use their intuition and you can find my many teaching videos and insights on my You Tube channel. This is why I created this shop, to spread my art, passion and ideas to people around the world. My aim, is to help each and everyone who wants to learn the art of card reading! When you open a new deck, the cards instantly connect with your energy making it your very own, this is why « WE DO NOT ACCEPT RETURNS ». Please choose wisely or seek our help in picking one of our oracle, we will be glad to help you with this.